Water bottles are everyday items that have become an absolute necessity in our lives. Whether we are at office, the gym, headed to the beach, or just going for a jog, it’s important to carry a water bottle with us to help keep ourselves hydrated. But over the years, water bottles have become more of an activity-based item than for mere purpose. Picking the right water bottle is key, so here are some tips on how you can choose the perfect water bottle for yourself. There are so many different kinds of water bottles available in the market, so it can be difficult to choose a single type. So, before you decide, you need to determine the bottle’s purpose. 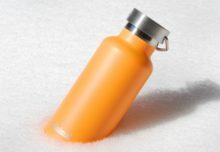 A water bottle that you use while exercising is very different from the one you’ll need to carry hot beverages in. Once you have determined the purpose, the next thing you need to focus on is size or capacity. It has to coincide with your activities. Normally, you find bottles that can hold between 500 ml to a liter of water. Choose the one that suits you and your activity best. Next, you need to consider the shape of the bottle. The shape depends on what you’ll be using the bottle for. Water bottles for running should be slender and easy to carry while ones for hiking should be larger and capable of carrying more volume. The nozzles on water bottles should make it convenient for when you need to drink some water. When you’re exercising, you need a nozzle that will let you continue working out without having to struggle to remove the lid. A wide-mouth bottle can cause spilling, so one with a narrow nozzle is ideal. Water bottles are normally made of plastic, stainless steel, or glass. Plastic water bottles are more durable and convenient, but some bottles may contain a chemical called bisphenol A (BPA), a compound that is believed to cause diabetes and cancer. Stainless steel water bottles provide excellent insulation than glass or plastic bottles, so you can store hot or cold beverages comfortably. Minimal water bottles have excellent advantages since they are made from stainless steel and are reusable. Minimal also makes compact, lightweight jars and flasks that are easy to carry and very portable. All Minimal products are free of BPA and phthalates and are made from food grade materials, making them the safest water bottles available.